What Is DACA And What Happens Next? Nearly 800,000 young immigrants are in limbo following President Trump's decision to rescind the Obama-era program known as DACA. Here's what you should know about the program and what happens next. 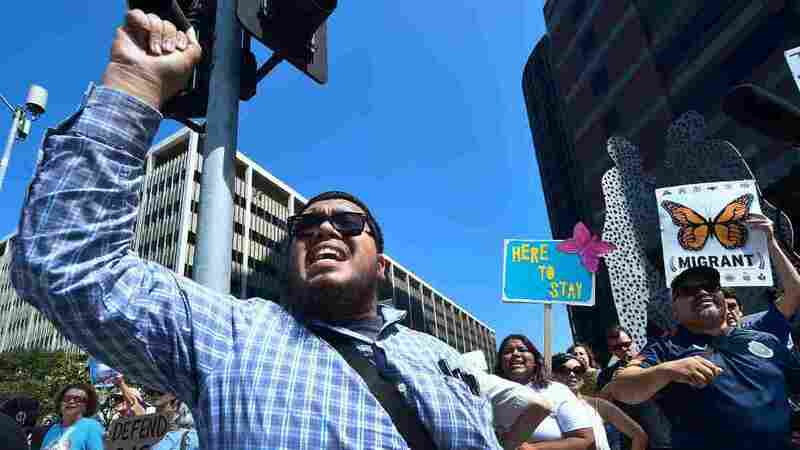 In Los Angeles, a supporter of the Deferred Action for Childhood Arrivals, known as DACA, protests the Trump administration's decision to end the program. The Trump administration announced Tuesday it would end the Deferred Action for Childhood Arrivals program, or DACA, in six months if Congress doesn't find a more permanent solution. Since it was enacted under President Barack Obama, about 800,000 immigrants who were children when they arrived in the U.S. illegally have received protections from the program. They include stay of deportation and the ability to legally work and go to school. In a tweet Tuesday evening, Trump signaled he supports legalizing DACA, saying he would revisit the issue if Congress can't legalize the program. DACA is the acronym for Deferred Action for Childhood Arrivals, a program created in 2012 by the Obama administration allowing young people brought to this country illegally by their parents to get a temporary reprieve from deportation and to receive permission to work, study and obtain driver's licenses. DACA applicants had to be younger than 31 years old when the program began. They also had to prove that they had lived in the United States continuously since June 15, 2007, and that they had arrived in the U.S. before the age of 16. Those signing up for DACA must show that they have clean criminal records. They have to be enrolled in high school or college, or serve in the military. Their status is renewable every two years. 2. Who are the DREAMers? There are about 800,000 DACA recipients, also known as DREAMers, according to U.S. Citizenship and Immigration Services. Most arrived from Mexico, El Salvador, Guatemala and Honduras. There are also several thousand from Asia, primarily South Korea and the Philippines. They reside in every state, with the largest concentrations in California (222,795), Texas (124,300), New York (41,970), Illinois (42,376) and Florida (32,795). The term DREAMer is derived from a legislative bill, first introduced in 2001, called the Development, Relief and Education for Alien Minors (DREAM) Act. It has yet to be approved by Congress. 3. Why was DACA created? Unable to find a legislative remedy to protect minors who were brought to this country through no fault of their own, the Obama administration created the DACA program through executive action in June 2012. Conservatives accused Obama of overstepping his authority, but they brought no legal challenge. The DREAMers are a highly organized group of young people who argue that, after being raised and educated here in the U.S., they are Americans who only lack legal recognition. At the time DACA was created, Obama's executive action had strong public support according to a 2012 Pew Research Center survey, which found that 63 percent of those polled approved of the program. A more recent poll by NBC News/Survey Monkey found that nearly two-thirds of Americans favor allowing the DREAMers to stay in the U.S.
4. Why did Trump end DACA? During the campaign, Donald Trump railed against illegal immigration and promised to reverse what he called President Obama's "unconstitutional" executive actions. But as president, Trump began backtracking. Early on, he said a decision about the fate of the DREAMers was "very difficult" for him, but "we're going to show great heart." As recently as last week when he was asked about his impending decision, Trump said "we love the DREAMers." Conservatives, who had anticipated swift action from Trump, repeatedly urged the new president to keep his pledge and "pull the plug" on DACA. The Republican attorneys general, led by Texas Attorney General Ken Paxton, gave Trump until today, Sept. 5, to decide DACA's fate. 5. Will the DREAMers be forced to leave? According to the Department of Homeland Security, DACA will be phased out, with an official end in six months. U.S. Citizenship and Immigration Services (USCIS) will process all new applications received as of Sept. 5 and then stop accepting applications. DREAMers whose work permits expire before March 5, 2018, can apply for a two-year renewal, but they must meet an upcoming Oct. 5 deadline. The government will not terminate "previously issued deferred action or revoke Employment Authorization Documents." But the announcement by DHS also ends on an ominous (for DREAMers) note: DHS will "continue to exercise its discretionary authority to terminate or deny deferred action for any reason, at any time, with or without notice." The process announced by U.S. Attorney General Jeff Sessions is designed to "create a time period for Congress to act — should it so choose." There is no way of knowing whether Congress will ever come to the DREAMers' rescue and craft a plan that salvages any of the protections brought by DACA. In a statement about DACA, President Trump called on Congress to act, but he did not specifically endorse legislation to preserve it. It is also not clear that if Congress fails to act, DREAMers immediately would become ripe targets for deportation. In his statement Tuesday, President Trump said, "I have advised the Department of Homeland Security that DACA recipients are not enforcement priorities unless they are criminals, are involved in criminal activity, or are members of a gang." Trump tweeted Tuesday night that he will "revisit this issue" if Congress doesn't legalize DACA. But DACA advocates say they already have documented cases in which DREAMers, with valid DACA protections, were apparently targeted by agents of Immigration and Customs Enforcement.